When it comes to pregnancy and childcare, there are a million and one stories on both ends of the spectrum: of happiness and joy as well as of sadness and loss. However, when it comes to cancer and its impact on a woman’s life, especially when it comes to prospective motherhood, there is one story that truly stands out. This story is a beautiful source of inspiration for all prospective mothers who are dealing with the effects or after-effects of cancer. It is the story of a passionate and resilient nurse named Rachel Stone. Rachel is a woman who went through an earth-shattering revelation when her doctors discovered she had a BRCA-2 cancerous gene mutation. This mutation raised her chances of developing ovarian and breast cancer considerably, and even more troubling was the fact that if she ever decided to get pregnant, her cancer might become activated. Since pregnancy accelerates cell multiplication and hormonal changes can contribute to cancerous cell growth, it was highly likely that she could develop breast cancer, or even another form of cancer within the nine months of pregnancy and for someone who’s always wanted to be a mother, this was heartbreaking news. Now the big question was what could should she do about it? As a busy student in nursing school, Rachel examined her significant familial-history risk, her ultimate desire to one day become a mother, and began to research diligently. She didn’t actually have cancer yet, but as she grew older and particularly if she went through with pregnancy, she most definitely could end up with this life-limiting disease. 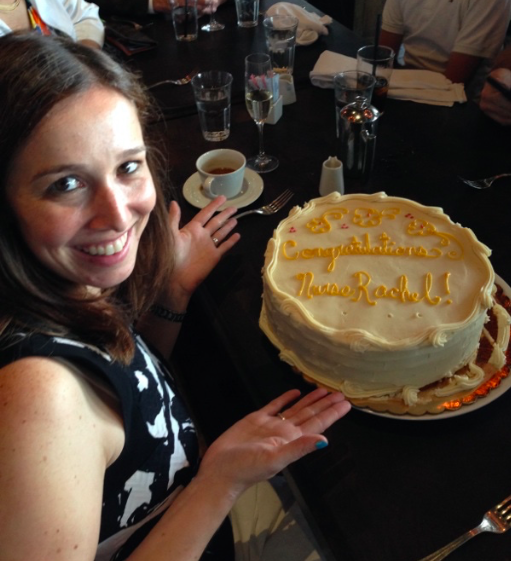 As Rachel continued her in-depth research about the BRCA-2 gene mutation, she joined a cancer-specific support group, and four of her new friends found malignancies during or after pregnancy with the same gene mutation. This series of events highlighted for Rachel just how risky this process could become, but it also encouraged her to see that women just like herself could become pregnant and deliver healthy, happy kiddos – there was still hope. After much discussion with her doctors and deliberation, this brave woman came to the decision to endure a prophylactic mastectomy and remove the greatest risk to her and her potential future baby’s health, her breasts. A double mastectomy is a surgical procedure that removes the at-risk breast tissue from both breasts, and prophylactic means ‘any precautionary step taken to prevent the occurrence of disease’. This decision was not an easy one to make for several reasons: Rachel would have to go through a physically taxing operation resulting in her sacrificing a very personal element of her femininity. The surgery itself came with many risks, not least of which was the concern for reconstruction. She would also be unable to breastfeed her future children. The latter was the reason why Rachel deliberated so much because she worried about the ramifications of depriving both herself and her baby of the benefits of lactation. Still, the fact remained that the benefits of a prophylactic mastectomy far outweighed that loss, and other risks, and with that Rachel scheduled the serious procedure, and withstood months of difficult recovery – all while completing nursing school. So . . . is it + or – ?! Once she successfully underwent the primary surgery and the subsequent revision surgeries, the most incredible thing happened for Rachel and her family: she was able to get pregnant! This incredible victory was hard-won after a long road of infertility and multiple IVF treatments. The infertility was due to diminished ovarian reserves – most likely due to the BRCA mutation. The exciting news came as a welcome relief and a huge source of delight after an understandably challenging and heartbreaking time. Becoming pregnant, and staying pregnant with a healthy baby after undergoing a double mastectomy with an active BRCA-2 gene mutation is nothing short of magic. During her first trimester, Rachel shared she had frequent back pain that seemed excessive in comparison to what she’d heard from other expectant mothers. Visits to a perinatal chiropractor brought some relief and shed light on the fact that due to her double mastectomy, her nerves were mistakenly sending pain signals to her back instead of breast area. She was able to work through this with additional visits, but this was a truly unusual reality to be in and one she wants to share with others who may go through a similar path towards motherhood – the ghost pains are real! Also, the areas around her surgical incisions and under her arms (where she still had some breast tissue remaining) were considerably tender. Still, the joy and anticipation of having this baby far outweighed the (significant) difficulties that Rachel endured. 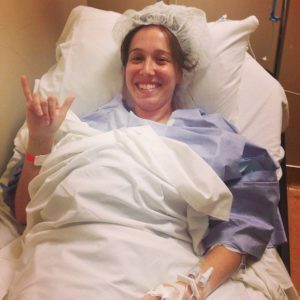 During her second trimester, Rachel’s surgical areas became slightly swollen again and she once again had phantom pain in the areas where she had post-op drains placed, not only that but her persistent backache was back. 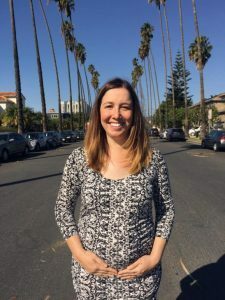 Throughout the second trimester Rachel made frequent visits to her chiropractor to manage the discomfort, and powered on with even more tenacity and strength. These few weeks were very difficult and led to her truly absorbing the stark reality that she wouldn’t be able to breastfeed in the traditional sense, and this hit her hard when she went to the OB/GYN to get herself set up for her birthing plan. Amazingly enough, the woman at the office suggested several incredible, new nursing items that she could use to bottle feed and chest feed her baby! For instance, check out The Beebo which allows parents to bottle feed at any angle, hands-free, while mimicking the breast. Rachel knew that this aspect of motherhood would look different for her and her baby, but most importantly she was going to make sure her baby was fed, and that she herself was taken care of nutritionally and otherwise postpartum. Rachel is currently in her third trimester with her baby due on May 12th. We wish her all the very best for her future and look forward to updating this post with news of the healthy and happy birth – we are so amazed by Rachel and cannot wait to lay eyes on her magical miracle baby! This unbelievable story was made public by Rachel herself via her blog Funky Genes because when going through such trying times, she discovered that not much useful information was available for prospective mothers who were suffering from, or were at high risk of developing cancer related to this BRCA-2 mutation. Add to it some kind of guide regarding pregnancy after getting a double mastectomy, and the information was literally non-existent! When she couldn’t find similar stories to educate herself, Rachel decided to share the story of her personal journey as a valuable piece of experience that can help out other women in similar situations. Most importantly, this story is like a beacon of hope that there is indeed light at the end of this dark and frightening tunnel, hope that a woman is strong enough to go through the toughest of battles and still come out standing resilient and victorious. When Rachel delivers her child she may very well be in need of a nanny or newborn care specialist. Her body may be more physically taxed than the average woman, post-childbirth. As nannies and newborn care specialists, this is where we would jump in and be able to support Rachel as she rests up and recovers her health, while enjoying the beautiful moments of motherhood that she’s fought so hard to enjoy. There aren’t many nannies that are trained to handle the specific potential needs of such a mother, but an experienced infant care specialist and postpartum doula would be the ideal supporting team to assist Rachel for the first few months. This story has been such an eye-opening education for all of us about the potentially harrowing events a mother goes through on her journey to motherhood, and in this case how motherhood happens post-mastectomy, and how best to support + nurture that mother and child post-birth. As nannies, private educators, childcare specialists and NCS’s, we have to remember that we’re working with precious gems that have been hard-won in many cases, and these children are dependent upon us during some of their most vulnerable moments. It is an honor and a privilege to support our nanny families, and keeping in mind that their journey to becoming a family may not have been typical, clarifies for us how to better nurture + support the family as a whole. If you wish to stay tuned to Rachel’s inspirational story, read her blog posts at Funky Genes. If you have any questions for us, or just want to follow along as we work to make the most ideal connections happen within the nanny + childcare specialist community, you can find us on Facebook, Instagram, Twitter, and check out more fun posts and helpful resources on our blog.